Exclusive combination of nutrients to ensure a safety digestive optimal proteins (L. I. P.) and favor the balance of intestinal flora (prebiotics: FOS, MOS), thus contributing to improve the quality of the stool. 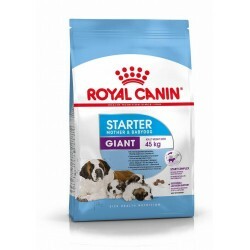 Helps to keep the pace high in the first growth phase of the puppy of giant size and to avoid excessive weight gain thanks to the contribution of energy facilities. Contributes to good bone mineralization, in the puppy of giant size, thanks to a balanced intake of energy and minerals (calcium and phosphorus), thus ensuring the consolidation of the bone and helping to protect the joints. Helps to strengthen the natural defenses of the puppy, in particular thanks to a complex of antioxidants and mannan-oligosaccharides. I think for puppies of giant breeds is very tasty and with a combination of ingredients suitable for them. It is developed with components for easy digestion and contains FOS, and fibers that stimulate the intestinal flora. It has a high content of proteins that ensure a growth with strong muscles. It is low in calories and fat to prevent being overweight that often affects these races. It is enriched with antioxidants, mannan-oligosaccharides which favour your immune system. 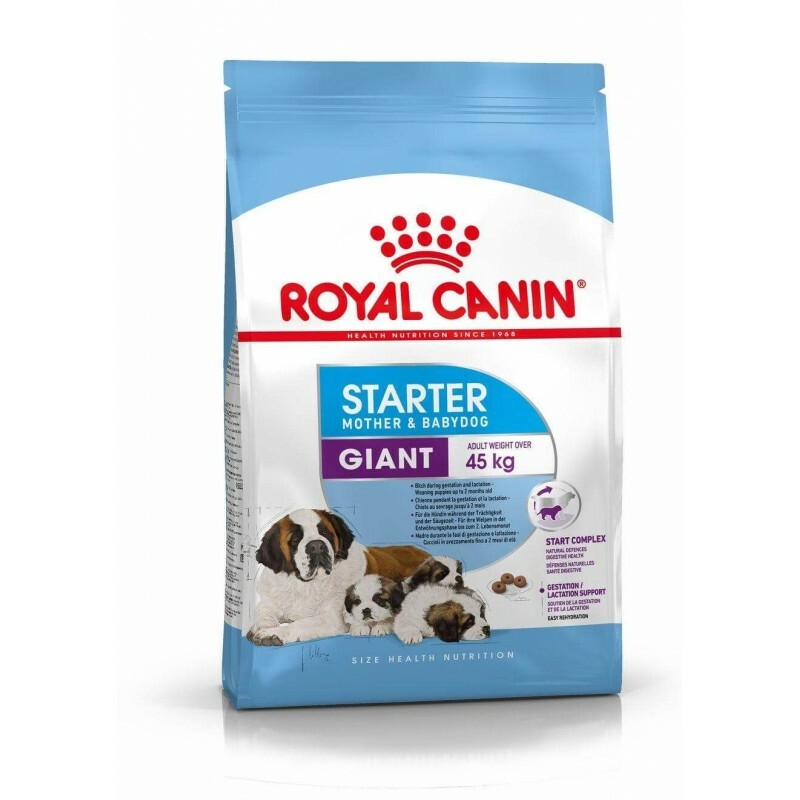 Dog food specifically designed for the daily feeding of puppies of large breeds that in adulthood they will have a weight greater than 45 kg Is ideal to give it to them until they reach 8 months of age approximately. dehydrated poultry proteins, rice, isolated from vegetable protein*, maize, animal fats, hydrolysed animal proteins, beet pulp, minerals, soya oil, yeasts, fish oil, fructo-oligosaccharides, integumentos and seeds of psyllium, hydrolyzed yeast (source of mannan-oligosaccharides), hydrolysed crustacean (source of glucosamine), Rose extract of India (source of lutein), hydrolysed cartilage (source of chondroitin). Nutritional additives: Vitamin A: 17100 IU, Vitamin D3: 1100 IU, E1 (Iron): 48 mg, E2 (Iodine): 4.8 mg, E4 (Copper): 8 mg, E5 (Manganese): 63 mg, E6 (Zinc): 189 mg, E8 (Selenium): 0.08 mg - Preservatives - Antioxidants. Crude protein: 34% - Oils and fats gross: 14% - crude Ash: 7,2% - crude Fibre: 1,3% - Per kg: Calcium: 10 g - Phosphorus: 8.5 g - Fructo-oligosaccharides: 3,4 g - Mannan-oligosaccharides: 0.5 g.*L. I. P.: protein selected by its high assimilation. Description: SAFETY DIGESTIVE Exclusive combination of nutrients to ensure a safety digestive optimal proteins (L. I. P.) and favor the balance of intestinal flora (prebiotics: FOS, MOS), thus contributing to improve the quality of the stool. 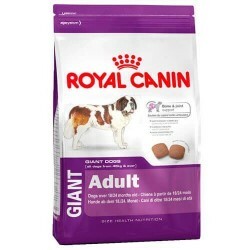 Adult dogs of giant breeds (over 45 kg) require kibble with a size, shape, special, for a chewing-intensive and slow.